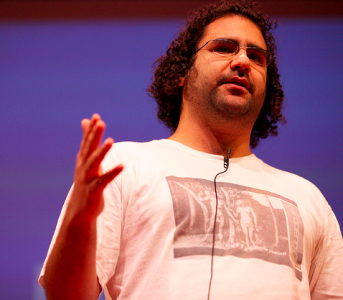 Alaa Abd El Fattah, a well-known Egyptian blogger and activist who was imprisoned in 2006 under the Mubarak regime, learned on Monday that he has been summoned by a military prosecutor. Though he was expected to face the prosecutor today, his summons was postponed until Sunday, when he returns from the United States, where he's speaking at a conference on technology and human rights. According to a tweet, he suspects that he will be charged with incitement to violence and destruction of public property. According to Al Masry Al Youm, a video blogger has claimed to have video evidence against Alaa that shows him throwing stones on October 9 and alleges that the blogger incited violence during the massacre of Coptic Christians that took place that day. The video, posted to YouTube, contains no evidence to support the claims. In contrast, Al Masry Al Youm states that it witnessed Alaa assissting the wounded following protests on October 9. Let me take 30 seconds to speak out against extra-ordinary justice. I’m going to be facing it when I get back to Egypt, in front of our military government. Here you should be familiar with extraordinary justice, as it was practiced in Guantanamo. There are roughly 12,000 civilians in military prison right now, for participating in a revolution the military pretends to have sided with, and sometimes it is for events in which the military committed the crimes, not civilians. I urge you to find ways to stand with anyone facing this future. Under SCAF rule, free expression is not a right, echoing for many life under the Mubarak regime. In July, Asmaa Mahfouz was interrogated over a tweet, while blogger Maikel Nabil Sanad has been imprisoned since April and on hunger strike since August. The entire muslim world is crazy because of what islam teaches. The koran is a book of violence just as Hitler’s mein kampf book is. I will never trust a muslim, except the Ahamadyya, as they have a prophet after Muhammed that calls for peace-the peace defined in the dictionary, not the peace defined in islam, that after my death and all non muslims, there will be peace according to islam. However, muslims can’t stop killing muslims, so even with islams definition of peace, it will never happen. Dude.. just focus on the man and his case will ya? Leave Islam and your “trust” issues to yourself. Why are we becoming so intolerant of criticism from the civil society? Is it owing to the intrinsic attitude of politicians and powerful persons to act as tyrants of the middle ages? Wth brings religion in this? This has nothing to do with religion, EmilyWatson. But you clearly don’t know anything about Islam.